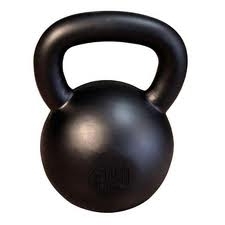 Handles on heavier kettlebells are large enough to accommodate both hands. In training rooms across America, from urban fitness centers to basement gyms, hard-core lifters and other fitness enthusiasts are pushing themselves with Kettlebells. Best described as cannonballs with handles, these iron spheres originated in Russia as the muscle-building tool of choice for Red Army soldiers and athletes. Today "KB" workouts, which produce particularly impressive gains in the legs, hips and shoulders, are all the rage. There are more muscles involved in balance and leverage with the kettlebell; you work every muscle just keeping them up and moving them around you. By training with Body-Solid kettle bells, you'll achieve strength, endurance and body shaping as you build core strength with every successive workout.